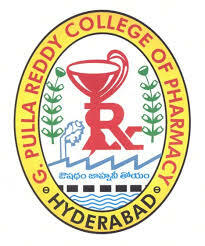 G. Pulla Reddy College of Pharmacy was established in the year 1994-95 by G. Pulla Reddy Charities Trust. The college is affiliated to O. U., Hyderabad Approved by AICTE and PCI, New Delhi ISO 9001:2008 Certified Institution for Graduate & Post Graduate Education. Admissions are conducted in a systematic manner by means of web counseling based on the rank by convener EAMCET. Thus opportunity is given to the student to choose the course and college. 70% of seats are filled through the EAMCET rank and 30% seats are filled by the management based on the merit at Intermediate (with minimum 45% of marks). The students are given ranking based on the marks obtained in the test and percentage of marks at intermediate level or 10 + 2 level. The College is located in a beautiful campus in Mehdipatnam, Hyderabad. The campus is spread over in 5 acres of land in a calm & quiet natural habitat. College provides huge campus; centrally air conditioned classrooms, convention centre, labs, library, food courts, students clubs and many other facilities for students to spend their precious years with enthusiasm. Placements are provided to deserving students. Are you Interested in G Pulla Reddy College of Pharmacy.